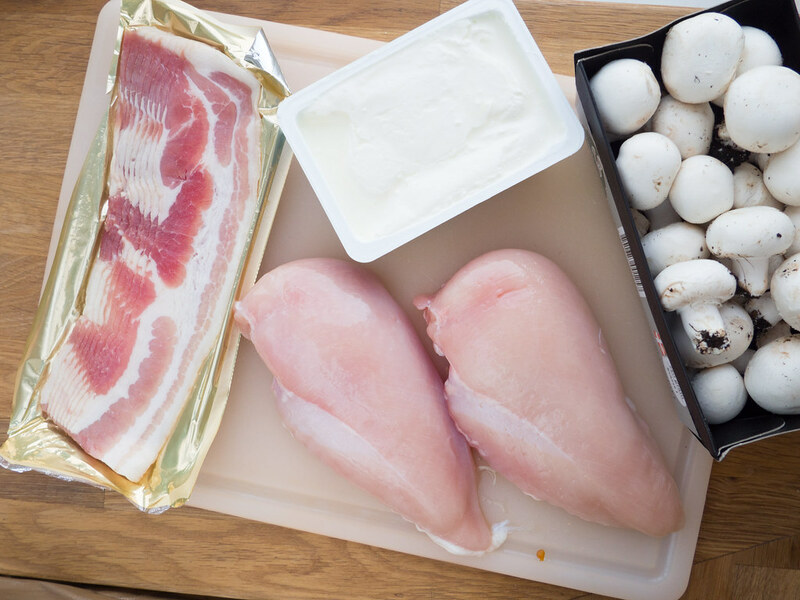 This recipe for cream cheese, mushroom and bacon chicken filet is one of my favorite everyday dishes. 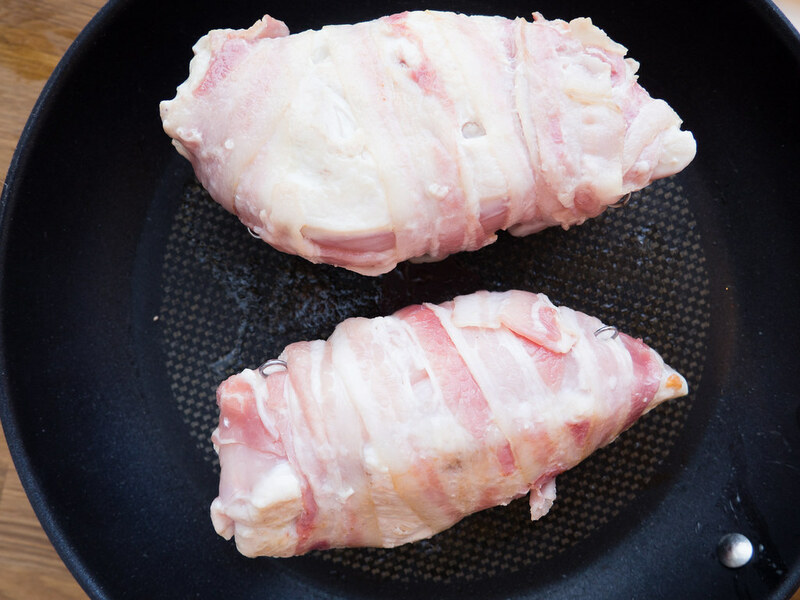 The fact that these stuffed chicken filets are super easy to make and that they have a great taste makes them very popular in my home. I have now made these chicken filets so many times that it is one of the fastest dinners I can make – from start to serving it takes about 25 minutes to prepare this dish. Of course, the first it might take you some extra time. 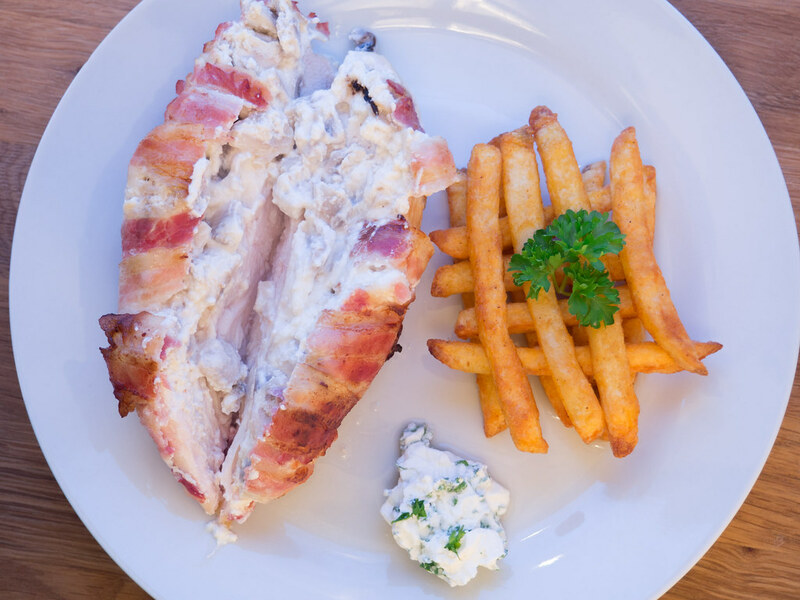 Because this bacon chicken is so easy to prepare I also typically just end up serving them together with some homemade oven potatoes or, when I am very lazy, just some pre-made oven fries. However, this stuffed chicken also goes perfectly together with a homemade and fresh green salad. I can recommend to take a look in my section with salads if you are looking for some inspiration. 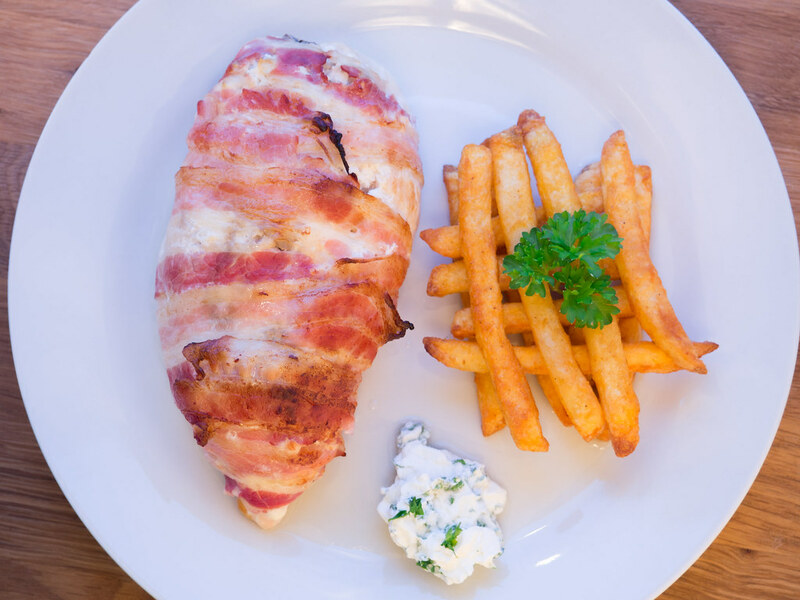 As I have mentioned above, this cream cheese and mushroom stuffed chicken is very easy to prepare. You start by cutting a lengthwise, long and deep groove in the chicken filet. Put the chicken aside while preparing the stuffing. Clean the mushrooms and slice them up nicely. 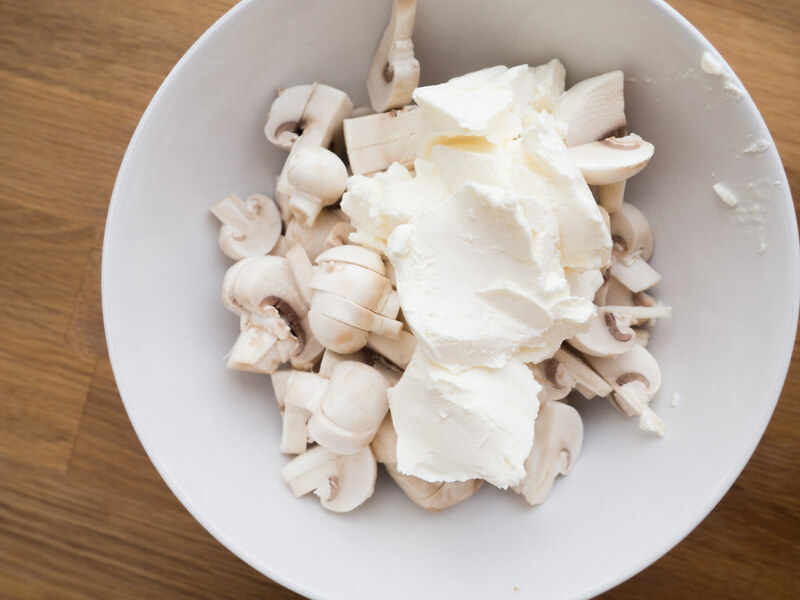 In a bowl, mix the mushrooms with the cream cheese. 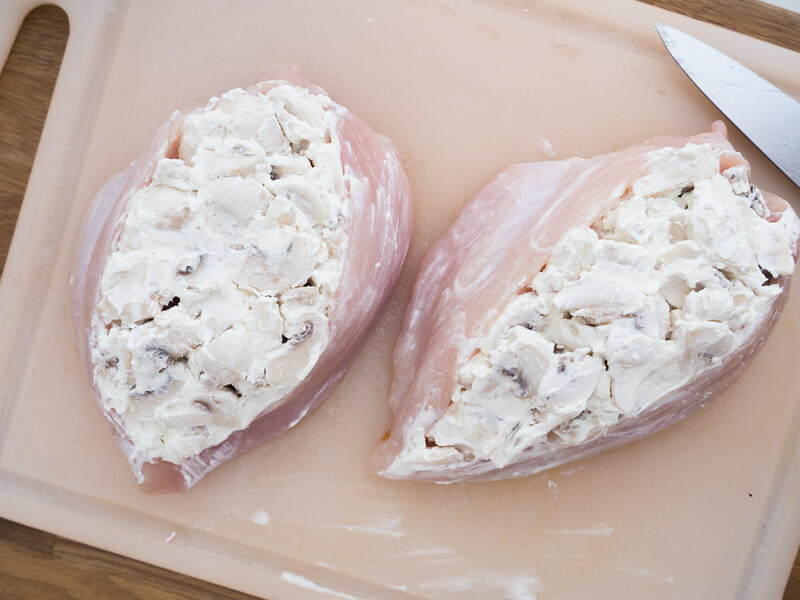 Now use a spoon to fill the chicken filet with the mushroom and cream cheese mixture. 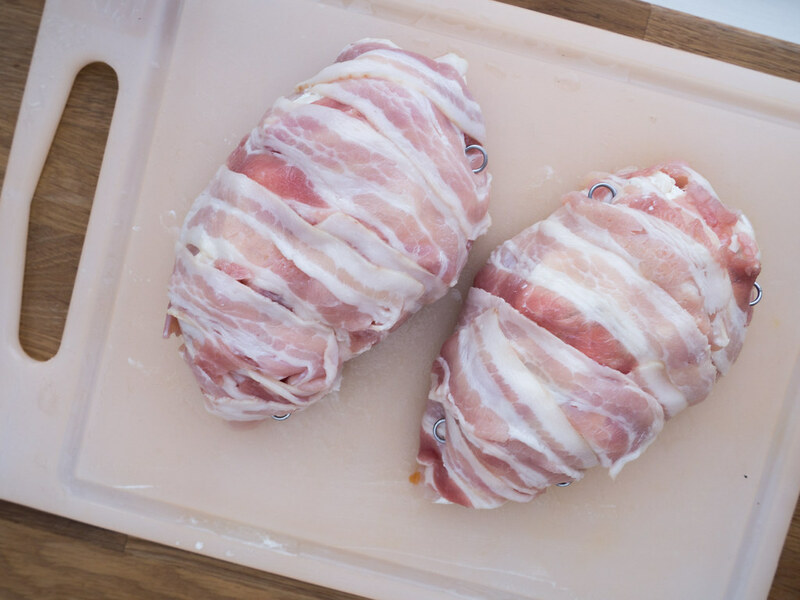 When done, wrap each chicken filet with some bacon stripes. I normally uses about 2-3 stripes for each chicken filet. If you have some meat needles, you can with advantage use them to secure the bacon to the chicken a little better. However, this step can be omitted. Now fry the bacon chicken for about one minute on each side on a frying pan. Transfer the chicken to an ovenproof dish. Finally, cook the chicken in the oven for about 15-20 minutes depending on the size of the filets. 1. Start by cleaning the chicken filet by cutting away any unwanted fat or smaller bones if necessary. Then cut deep and long lengthwise grooves in the filets. Put the chicken aside and continue with the next step. 2. Clean the mushrooms using cold water and slice them up. 3. 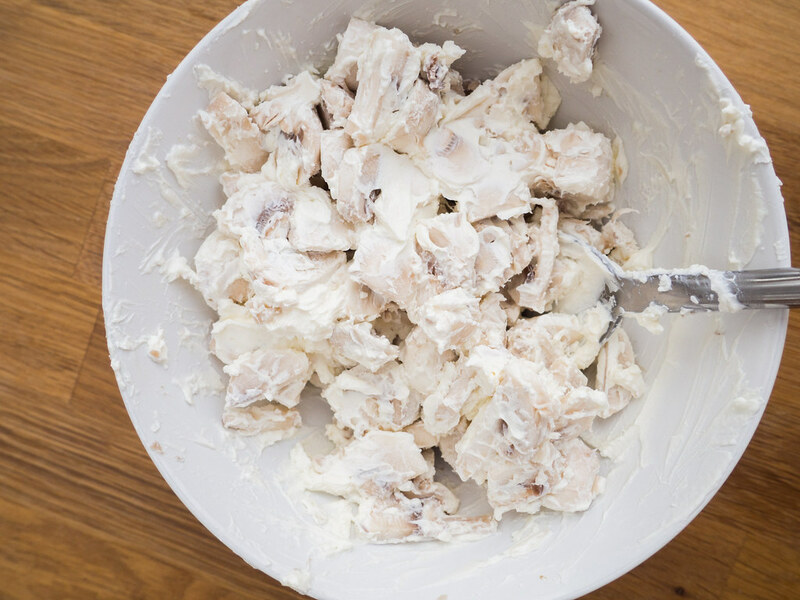 In a bowl; mix the sliced mushrooms and the cream cheese. 4. Now spoon the mushrooms and cheese mixture into the sliced chicken filet. 5. Wrap 2-4 bacon stripes around the filets. Secure the bacon with meat needles if you have some. This last step can be skipped if you tightly wrap the bacon. 6. On frying pan; fry the chicken for about one minute on each side. This will make the bacon a little crisper. 7. Transfer the chicken to an ovenproof dish and cook them in the oven at 200 C (400 F) for about 15-20 minutes. The cooking time depends on the sizes of the filets. Use a fork to gently test if the chicken is cooked all way through. Serve the chicken with some homemade oven potatoes and a simple green salad.